You wrote on your blog about being in a SoHo store, hearing one of your songs on the place’s radio feed, and how that made you feel closer to home. Beyond home, would you say that your relationship to cities is somewhat mobile? City lights, for instance, are probably most pronounced when you’re coming or going. I suppose hearing my song played in Soho NYC (as I was buying a hat) made me feel closer to home because whenever I connect with my music — no matter where I am — it reminds me of being the child in the bedroom, writing and recording my first compositions and that authenticity. I recorded hundreds of songs in this way, learning and having fun with it. So that makes me feel like home — home as in what’s inside you, what makes you connect with your upbringing and the beginnings of becoming a songwriter, in my case. I’ve lived in cities since I was about 20, but my upbringing on the isle of Mull in the Hebrides never leaves me. It’s like a constant tap, a source of belonging. I do like the movement in cities — what I do is observe, that’s how I create — and there is more to observe in a city. I think going home from that kind of city environment for me then does make me appreciate the contrast with my home (Mull) even more so, and you do appreciate the beauty all over again. So I would say it is that which is more pronounced. I first saw a city (Glasgow) at the age of 6, so coming to the city was memorable and that’s what the song ‘The Lights’ is about. The child leaving the bedroom, and opening up your senses to their attack / beauty / whatever else it is. That’s been my adulthood — trying to capture what is around me. It’s usually people. Dreams seem to play an interesting role in your relationship to cities. You dreamed about the city as a kid, and obviously you find your way to a few. In “Must You Get Low,” ‘song-narrator you’ seems to sing about how the city gave you a sense of identity. Dreams, and parts in them, can be written. Is there an element of a city to you that’s always dream-like? Yes, you can find the romance anywhere — even in the hustle of a city. I love ugly industrial city buildings. I used to drive to the dump in North Glasgow just to appreciate a particularly ugly pile of concrete; those journeys formed one of my early MHS b-sides, ‘Ugly Buildings Are Beautiful’. The song ‘Must You Get Low’ was my take on a city, in that it has a heart and a beat and personality much like we do. So the verses in the song were looking at my relationship and engagement with the city as just a small part of that pulse. Another part of the song (‘We write Dreams so what’s your part here’) was imagining an Orwellian group running the city’s subjects — controlling their lives (which was my original fiction in the song ‘Mull Historical Society’ of a group, in that case, controlling the island). The third element in the song (the choruses) is about a relationship of two people living in that city. This is sounding like some form of song maths in the explanation — but really it all comes from a spark, a feeling, something that touches me that makes me want to capture it. The romance, the city, its people. If I don’t capture it then I’ll lose it and a bit of me with it. This is sounding like some form of song maths in the explanation — but really it all comes from a spark, a feeling, something that touches me that makes me want to capture it. The romance, the city, its people. If I don’t capture it then I’ll lose it and a bit of me with it. How much of a city for you is in the parts that don’t look so great under some lights? I suppose some of this is addressed above. I like to focus on small things, micro situations that hopefully tell a bigger, more universal story. I think that’s because I come from a small community — I’m drawn to the small things. In my experience as a writer you can only capture what moves and excites you as the writer and hope it subsequently resonates with somebody else. Cities are the things you witness; there is also ugly and obviously some things you witness are disturbing, but if it affects you (me) then you want to document it. So a city is a lot of things all under one roof: Glasgow, London & New York are the cities which most influenced ‘City Awakenings’ — people are people wherever they are. And the stories are usually the same. Things shouldn’t always look so great under the lights. A lot of inspiration for me comes from the darkness. Things shouldn’t always look so great under the lights. Across the board, who are some of the writers who’ve influenced your own work? Here’s some — in no real order: Philip Roth. Bob Dylan. Paul Simon. The Flaming Lips. Bach. Mercury Rev. David Bowie. Per Peterson. Raymond Carver. Marilynn Robinson. The Beatles. Lou Reed. Neil Young. Radiohead. Belle & Sebastian. Mozart. Children’s toy music boxes. Television. 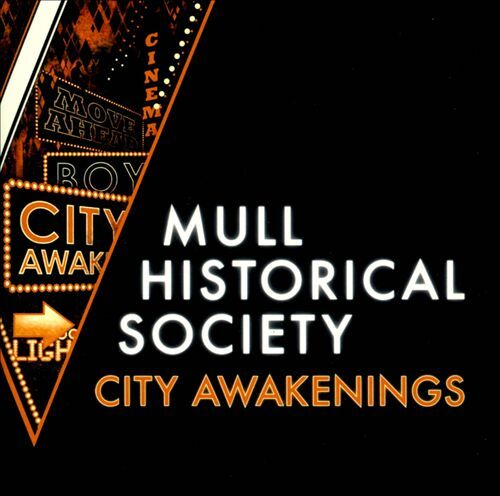 The tangible form of the latest Mull Historical Society album is slated for stateside soonish from http://www.xtramilerecordings.com. You can find out much more about Colin and where to check his music out at his site. This entry was posted in Interviews and tagged alternative, cities, city awakenings, city life, colin macintyre, mull historical society, music, rock, songwriting, words away interviews, writing. Bookmark the permalink.